We've been back at Craggy Wash for a few days and moved 3 times to get the right spot! The first spot we had was nice and private, but we had such a big rock/ mountain beside us that we couldn't get any sun there, and that's not good for the solar panels, plus it was sooo cool there. So we moved. 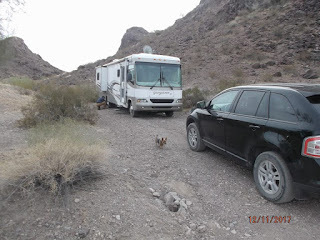 Moved around the bend, BUT then we were right on the road...so people walking by seemed right beside our RV and we were getting more dust, so we moved again, a bit further up. Now we're back in a spot we had when we first got here about a month ago. Added a privacy wall too on one side- for campers that pull up behind us! Love it!